Beautiful! Private! LakeFront Log Cabin Style Home with Private Dock and Seadoo Dandydock on Year Round Deep Water on Norris Lake in the Mountains of Tennessee. Main Level (street level) has the kitchen overlooking the dining room and great room. A master, queen suite with TV and full bathroom provides convenience of no steps required..
Upper Level offers two queen bedrooms with private sink/vanities. Both bedrooms straddle a Jack-n-Jill bathroom. Loft Level (2 levels up from Main Level) has full over full bunk beds. Lower Level provides second TV room, full bathroom, laundry room, spare refrigerator and two bedrooms (#5 & #6). Your private hot tub overlooking the lake soaks the overworked muscles after playing on the water all day :) **prior to each rental, we empty, clean, and refill the hot tub. Two decks provide a propane grill (free propane) and plenty of seating overlooking the lake. An observation deck built right on the shoreline provides a perfect reading room and tanning booth. Your private dock provides a covered boat slip, an uncovered slip, jet ski dock, and a HUGE swimming platform. John Bertke lives in Dayton Ohio and enjoys visiting Norris with his friends and family. He enjoys fishing and smoking cigars. He took over management of this property in summer 2017. They say 'location' means everything. "Jolly Mon" is 7 minutes from LaFollette, 5 minutes from the main road, inside a private community, nestled in trees, right on the water's edge. toilet, combination tub/shower, Upper level jack & jill between bedrooms 3 & 4. We provide hand towels and approx. 6 bath towels per bathroom. Very comfortable space with lots to offer! The property was very well managed! Everything was neat and clean and felt very welcoming/homey! We had 15 with us with plenty of room. Never felt cramped or on top of each other. Close enough to town if anything is forgotten, but secluded enough to feel like a movie. Would be great to visit in the summer. Recommend Jolly Mon cabin to everyone! Thanks for pointing out how this secluded area somehow managed to be so close to the town's many amenities. The Food Lion is only 7 minutes from the cabin's door making those forgotten items easy to recover. You really need to come back in the summer and soak in the clean, warm water. You definitely get a nice leg workout in from walking up and down the steps to the dock, but besides that we absolutely loved the Jolly Mon Lakefront cabin! It was plenty spacious enough for our crew of about 18 people and everything was very nice and comfortable for our weekend away. The location is perfect as well! Close to the "jumping bridge" and the dock is in a no wake zone letting you swim around the dock no problem! The dock was very spacious also so were were able to all hang around the water. We were provided instructions, maps, tips and ideas from the owner that made our trip that much easier. I would gladly stay at Jolly Mon again anytime. Your group definitely has the Norris Lake spirit. I hope you all come back. Thanks for pointing out the strategic location of just far enough away from the traffic yet still close to the popular "Jumping Bridge." This is a nice property and very comfortable. A few minor improvements and this will be the perfect place. The Jacuzzi smelled like urine so it could not be used. The elements on the grill should be cleaned so that the grill works properly. Great place to relax and enjoy the lake. I am glad you enjoyed our "nice & comfortable" cabin. For the hot tub ** before each new renter arrives, we actually empty the hot tub, wet vac the chambers, wipe the tub, fill with new city water, add bromine tablets. After all that, we all know the source of the new urine smell. Large home, great location and dock. Wonderful week in TN. First time at Norris Lake and it was memorable. Great location to stay. Very few issues: The upstairs A/C was on the blink and maintenance man was VERY quick to respond. Also it would have been nice to have power at the dock. Last drawback to the rental, the internet is essentially unusable at this home. Texting is poor as well. So if work is necessary to get done while your on vacation, plan to go into La Follette and use the Coffee shop's WIFI. The boat ramp is very steep, but launching and loading went well. Overall, the week was great and I would highly recommend the home for rental. Very clean with a home like feel. Updated appliances and everything worked perfect. Hot tub was on point after a long day skiing and wakeboarding. 10/10 would do again. Jolly Mon was an awesome place. We had 16 people staying here and had plenty of room. It is very cozy, warm an inviting place. The house was very well stocked with all you kitchen and bath needs. It was like being at your own home. It has a very nice covered dock for your use and a hot tub that our kids were in every night. Love this place! 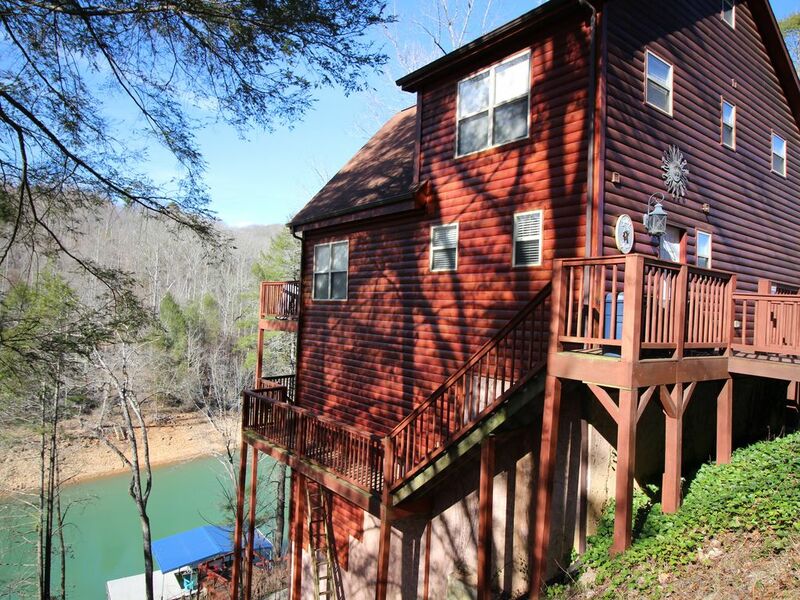 Jolly Mon cabin at Norris Lake is the perfect place to gather with your friends and family with plenty of space and things to do. Please call us for suggestions on golf, boat rental, restaurants, bedroom details, etc.